Andrew Van Till, the developer for DVRMSToolbox and many other excellent HTPC-centric applications created his own application which is part tool, part codec pack. 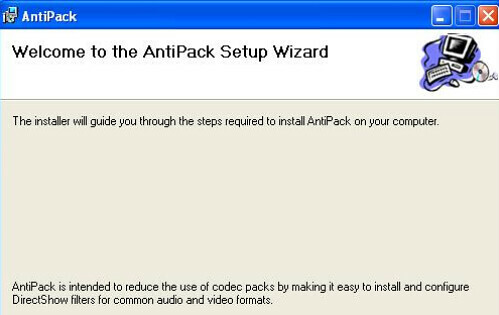 He calls this application “AntiPack” and has developed it to help guide you through the installation of codecs in a less haphazard way that walks you through the installation of the specific codecs you need for your system. Note that AntiPack is currently for x32 systems so if you’re using x64 you should wait until he updates it for those systems. UPDATE/CORRECTION: Andy tells me AntiPack should work fine for X86 players such as SageTV running on a x64 OS. It will not work for x64 players. I personally don’t deal with codecs too much any more as most of my TVs are connected with my HD Extenders. But I do have one computer-based HTPC client and of course the server HTPC. Even if you don’t have an HTPC, this app is a very useful tool that can save you hours of time dealing with problematic codec installs and uninstalls.